Victor Oladipo will make his second appearance in the Slam Dunk Contest. He finished as the runner-up in the 2015 Slam Dunk Contest in New York. Can the Pacers defend the NBA Dunk Contest title? The NBA announced Thursday that Pacers guard Victor Oladipo will compete in the 2018 Verizon Slam Dunk Contest Saturday, February 17, during NBA All-Star Weekend in Los Angeles. In addition to his first-career appearance in the NBA All-Star Game Sunday, February 18, Oladipo will make his second appearance in the Slam Dunk Contest. He finished as the runner-up in the 2015 Slam Dunk Contest in New York. 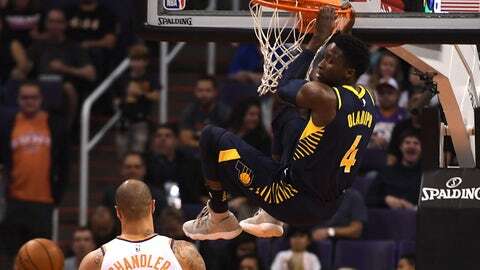 Oladipo will become the ninth player, and the second in as many seasons to represent the Pacers in the Slam Dunk Contest. Last season, Glenn Robinson III won the 2017 Verizon Slam Dunk Contest during All-Star Weekend in New Orleans. Last week, the NBA announced that Oladipo was selected by the coaches as a reserve in the 2018 NBA All-Star Game, and was drafted onto Team LeBron. In his first season with Indiana, Oladipo is averaging a career-high 23.9 points per game and has led the Pacers to a 29-23 record. The Slam Dunk Contest is the final event of All-Star Saturday Night, which also includes the Skills Challenge and 3-Point Contest. All-Star Saturday Night begins at 8:00 PM ET on February 17, and will be broadcast live on TNT.